“What if…” – a standalone phrase that we say all too often. I want to challenge you to not brush it off this time…but to let it sink in and to allow it to revolutionize your life. Let me state before I start, that this post is directed specifically for Christians. Now, read through the post, even if you didn’t pray…perhaps you feel like it later, if not, then not. Allow me to ask some bold “what if – questions”. You might want to read them as though they are questions you pose toward yourself. … I believed every word the Bible contains? … I believed that God truly loves me unconditional and always has my best in mind? … I believed that God is judge and that there is a hell? … I believed the punishment for sin is eternity in hell? Would I live differently? Would I then act differently? Would I stop to fancy sin? Would I fear God? … I believed that there was a heaven? … I believed God doesn’t want to see ANY person end up in hell? … I truly believed that Jesus has died for every sin and is willing to forgive ALL my sins? … I believed I am being forgiven in the same measure that I forgive others? … I believed the Bible is a love letter from God to me? … I believed that the great commission was given to me? Would I read my Bible more? Would I love more? Would I forgive more? Would I share the Gospel more? … I believed God truly knows the depths of my heart? … I believed God is the same: yesterday, today and tomorrow? … I believed submission to leadership is from God? … I believed that there lies immeasurable power in prayer? Would I allow God to purify me? Would I trust in His provisions more? Would I believe in miracles? Would I submit more instead of gossip and moan? Would I PRAY more? As a Christian we answer to all these “what if’s” that we do. However does that reflect in our behaviour? EVERY person on earth ALWAYS acts on what they TRULY believe. FAITH is only true and honest faith, if we act on it. It all started when I had too much time at hand and decided to find out what people really needed. 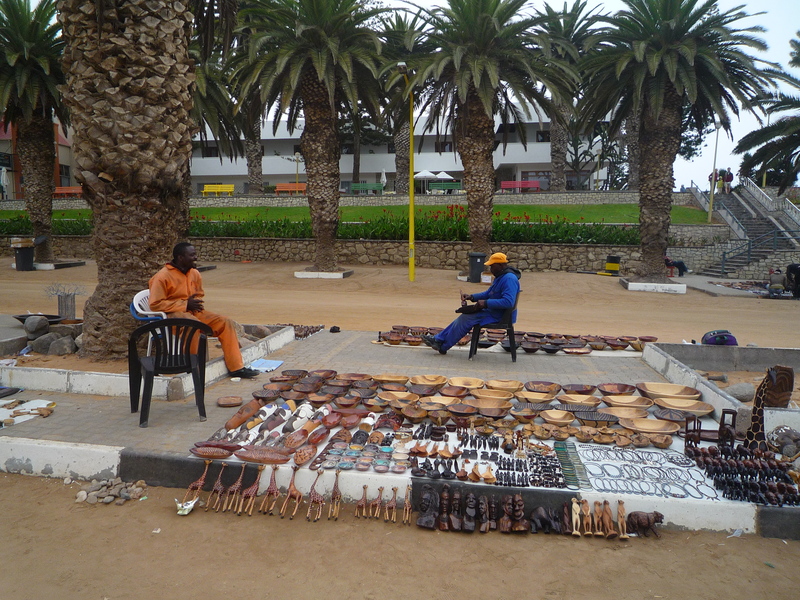 I walked down toward the Mole (that is the beach near the city centre of Swakopmund) and just before arriving there, I stopped at the wood crafters market. The men that work there make wooden souvenirs for tourists to buy and try to make a living of that. Most of them come from Kavango (an area in the north of Namibia), Zambia or Zimbabwe and Congo. Of course when I arrived I was treated like any customer…asked to come and look at their pieces of art and acknowledge their work. So I did… but not without letting them know that I wasn’t here to buy anything but to talk to them about Jesus. 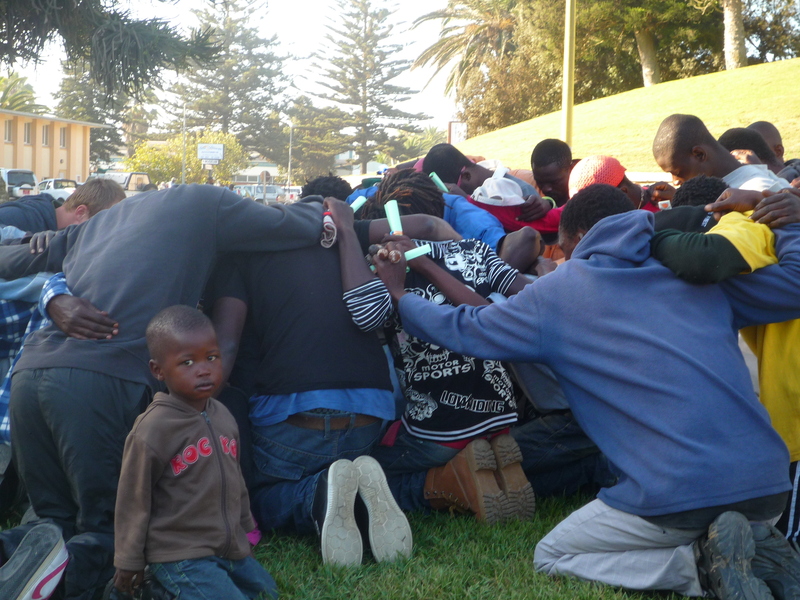 We talked and shared… about our lives with Jesus. And they voiced their need for Bibles… their need for someone to teach them how to reach out to their (mostly atheist) European customers. I promised to be back. Next time I went… I brought some Bibles I could get. They wanted me to write a dedication into each one of them. I exchanged cell numbers with Alex (a local there) to keep track of who needs a Bible still and who is to get the next one. So I went again… and again… sometimes with Bibles (sadly not every time, as I do not have some available every time I go) sometimes just to sit and chat. One day… Walter (an artist there) invited me…to come on Sunday afternoon and teach them. Spontaneously I said yes. That Sunday after Church I invited JP and Dorette & Leon to come along. All of them were all fired up to the task and we went at 15h to reach out at the wood crafters market. Inviting people individually we gathered them… and preached on the “Prodigal Son” – of the 30-40 men and women that came to hear, 8 or more got saved that day! The Sunday after we went again… teaching on “Why God allows suffering” as that was a topic that came up. 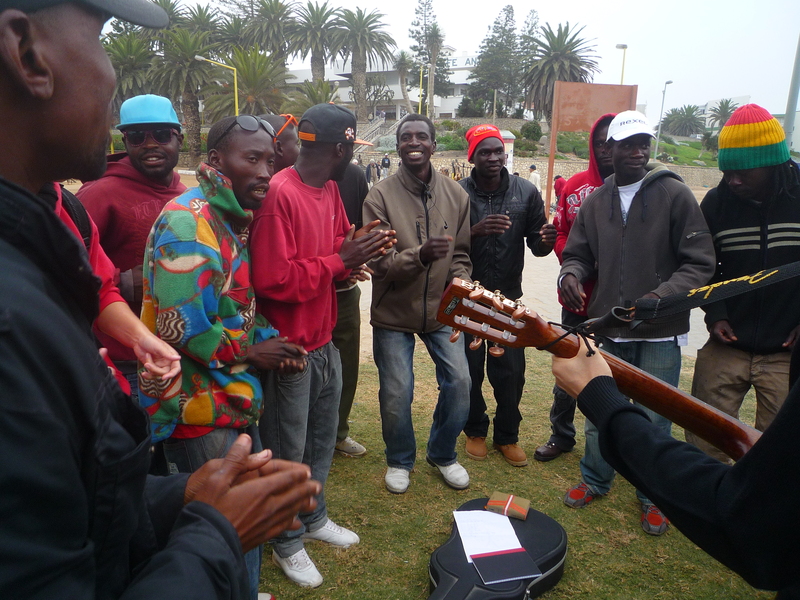 We also started bringing our guitars and introduced the song of “Jabulani Africa”. John entered discipleship with Dorette and Leon that day… wanting to be discipled as he is on the verge of being married. The next Sunday we went… we talked about following Jesus. Jesus being LORD and living a sanctified life! We also talked about baptism. Dominique as well as John decided they wanted to be baptised. We could not agree more. Both do not have a church yet and have a strong faith. So we agreed to go the next Sunday at 12h to baptise them in the sea. Today is the Sunday of Pentecost and the Sunday of John and Dominique’s baptism. Two men have decided to publicly proclaim their belonging to Christ! 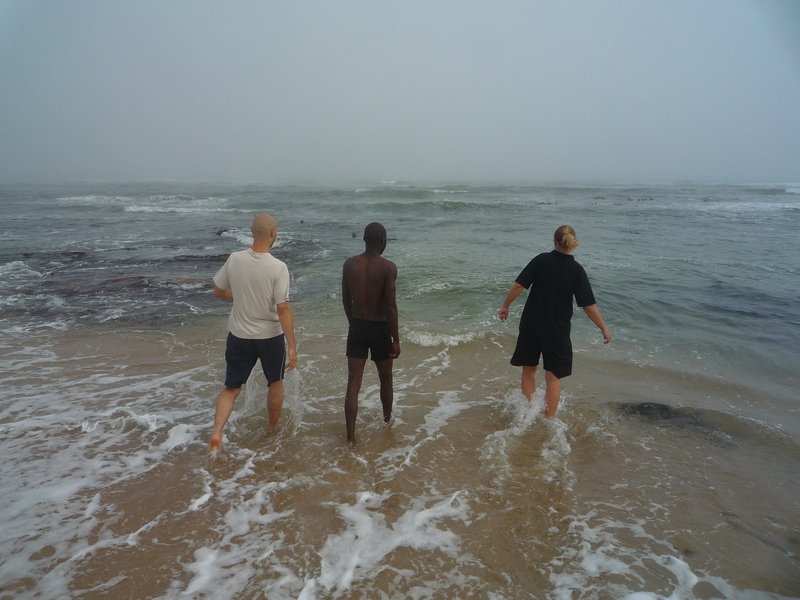 Dying to their old self and rising from the seawater clothed in Christ being a new person! gathering at the beach off we go into the water we baptize in the name of God the Father, the Son and the Holy Spirit. instantaneously glorifying God after rising from the water. We will continue to go… we intend to start discipling a group there and to help them to learn how to disciple others themselves (for we do not want this reaching out and fellowshipping to be nonexistent once we do not come). 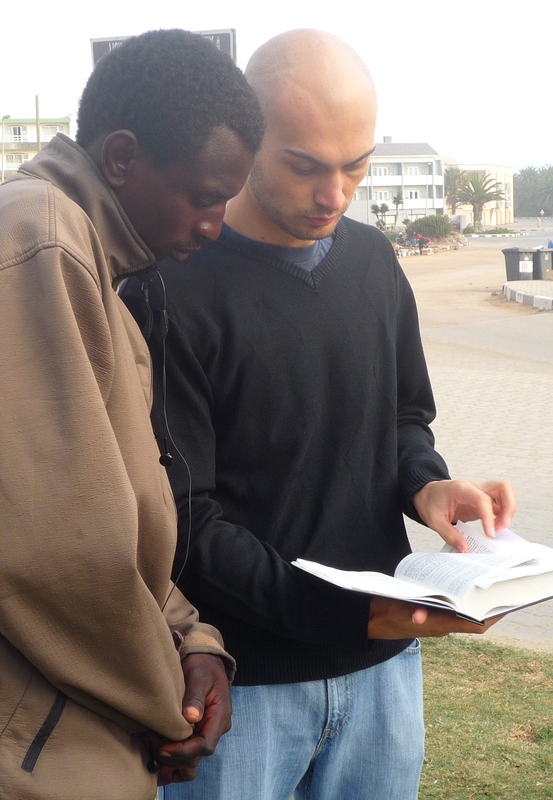 We intend to provide more Bibles… and to teach them how to reach out to their customers as they desire to. Please pray that we will get more Bibles and to gain wisdom to teach to open hearts and open ears and eyes. That more lives will eternally be changed! Making a living as a wood crafter is anything but an easy task. Many use witchcraft to gain customers and often therefore the Christians amongst them have a hard time to get round financially. Many have problems with alcoholism and need deliverance that only God can give. Please intercede for these precious men (and women) of God! May God bless you! And remember… one person CAN make a difference – by BEing the change! So often we get taught not to go into extremes. And let me tell you I feel that that is a good advice for many areas of life! However there is an area of life that affects every other area, where I feel this is not the right way to go about. The bible is very clear that in the heavenly realm there is no grey area. If we do not decide to be FOR God, then we are against Him. Many people are deceived by thinking a moderate and liberal view on Christianity is the best way to go about. Let me tell you… Jesus wasn’t liberal or moderate. Our GOD is a holy God, a God of love but also a just God. He is creator, so He sets the rules…and they have been set. You have to decide. No one can decide for you…no one should push you into a decision you don’t want to take…but by deciding not to decide…you are already making a choice. Decide whose side you want to be on…decide still today…think about it earnestly…be honest to yourself…and when you make a choice…make it wholeheartedly! Many Christians think they have chosen already… if you are a Christian… look at your life. Has your choice changed your life? Do the people around you notice you are different? Do you fear GOD, or do you fear man? Is your life a sanctified life?